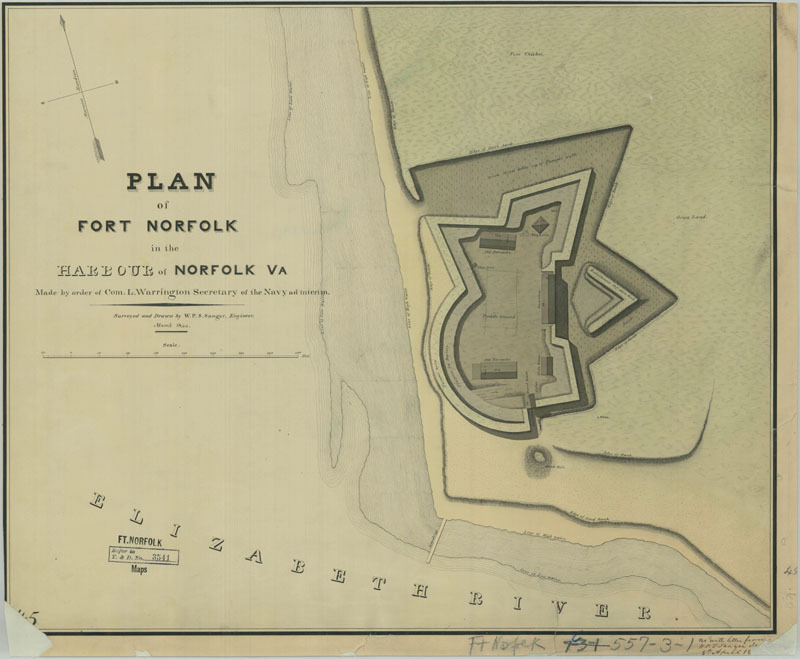 In 1849, the Navy discovered a more pressing need for Fort Norfolk. The powder magazine near Gosport Norfolk "the very best position for our magazine," but he initially encountered obstacles. "I understand," Navy Yard had deteriorated to an alarming degree. An estimated $100,000 worth of powder, fuses, rockets, and small arms ammunition were stored there under increasingly dangerous conditions. A naval ordnance inspector found holes in the roof of the magazine, powder leaking from barrels, and reported that sailors from the navy yard had been recently dispatched "to extinguish fires threatening the very gates of the building." The old magazine was so crowded "as to prohibit a rigid overhaul" (Bureau of Yards and Docks [BY&D] Letters Received, Box 155, Dornin to Sloat, May 14, 1849). Captain John D. Sloat, the commandant of Gosport Navy Yard, made a desperate plea for a new facility to Commodore Joseph Smith, the Chief of the Navy's Bureau of Yards and Docks. Sloat complained of "the dilapidated state and the exposed and inconvenient situation of the powder magazine." He declared that the situation had "been a source of great anxiety to me since I have been in command of this station." Local residents, he reported, had "increased their solicitude" by demanding that the Navy remedy the potentially disastrous situation (BY&D, Letters Received, Box 155, Sloat to Smith, May 17, 1849). Thomas A. Domin, the Navy's Assistant Inspector of Ordnance, thought Fort he reported, "that the War Department has transferred the whole establishment to the municipal authorities of the City for purposes of a sanitary nature in the event of the cholera reaching here." Domin also found that "both the councils and the leading citizens strongly object to our having it as a Powder Depot" (BY&D, Letters Received, Box 155, Domin to Sloat, May 14, 1849). Local opposition to the powder magazine at Fort Norfolk had apparently diminished by the autumn of 1849. In October, Commandant Sloat stated that based on "good authority" he understood that the proposed magazine at Fort Norfolk was "opposed only by a few interested individuals, the City authorities and prominent Citizens do not object" (BY&D, Letters Received, Box 155, Sloat to Smith, October 25, 1849). On September 14, 1849, Secretary of War George W. Crawford formally notified his naval counterpart, Secretary William Ballard Preston, that the army would conditionally relinquish its control of Fort Norfolk. Crawford stated that the Navy could take over the fort provided that the Bureau of Yards and Docks "could accomplish its object without interfering materially with the ultimate use of the fort." Preston agreed that "any improvements which may be needed will be submitted to [the War Department] for approval." Commandant Sloat was then directed to take possession of the premises. Fort Norfolk would henceforth fall under the jurisdiction of the commandant of the Gosport Navy Yard (BY&D, Letters Received, Box 155, Crawford to Preston, September 12, 1849; Preston to Crawford, September 17, 1849). Despite the Navy's urgent need for the new magazine at Fort Norfolk, it would be five years before the building was completed. Lack of funding, alterations in the building plans, disputes over the fort's boundary lines, and the diversion of construction materials to other projects at Gosport Navy Yard all accounted for the delay. When it was finally completed, the cost of the magazine far exceeded its original budget. 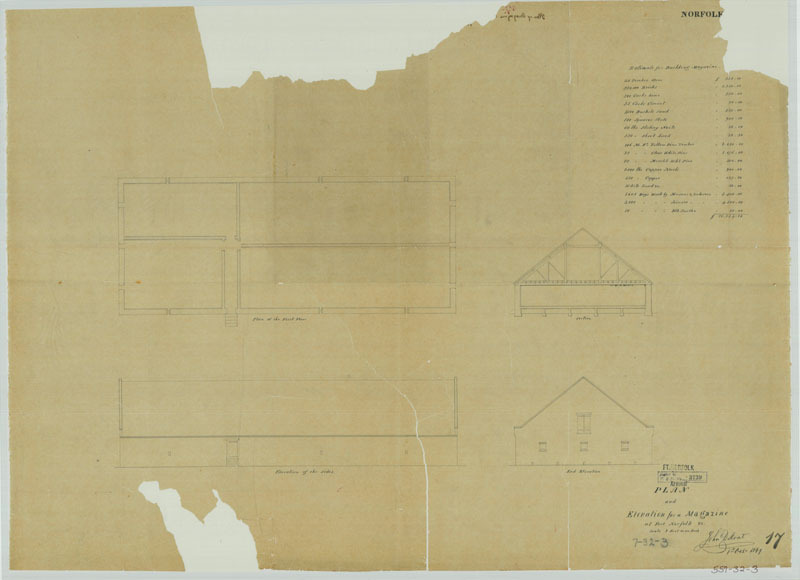 In October 1849, Commodore Sloat submitted plans for the magazine to the Bureau of Yards and Docks. Sloat proposed a structure measuring 136 x 55 ft., the same as the dimensions of the building when it was finally completed. However, the actual building would be far more substantial than Sloat envisioned. Apparently, there were no funds in that year's budget to begin the construction. One year later, Sloat finally received a response from Commodore Smith informing him that another building plan would be used (BY&D, Letters Received, Box 156, Sloat to Smith, November 6 and 25, 1850). During the winter of 1850-1851, Sloat was replaced as commandant of the Gosport yard. A CULTURAL RESOURCE MANAGEMENT PLAN OF FORT NORFOLK, NORFOLK, VIRGINIA prepared for U.S. Army Corps of Engineers, Norfolk District by the College Of WILLIAM & MARY, November 1995 under Contract No. DACW65-94-Q-0075. William Bradshaw and Julian Tompkins's Fort Norfolk, Then and Now (n.d.). The Norfolk Public Library vertical file of recent newspaper articles on Fort Norfolk. Including articles by James Melchor of the U.S. Army Corps of Engineers that describe archaeological and architectural findings on the fort property.